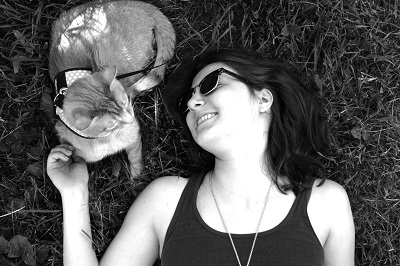 Soulistic promises to “Feed Your Cat’s Soul”, but what about their health? Read our unbiased Soulistic cat food review to find out if this brand is a nourishing, safe choice for your cat. We’ve analyzed Soulistic and graded it according to the We’re All About Cats standard, evaluating the brand on species-appropriateness, ingredient quality, product variety, price, customer experience, and recall history. Here’s how it rates in each of these six key areas. We give Soulistic cat food a 43 out of 60 rating or a B grade. 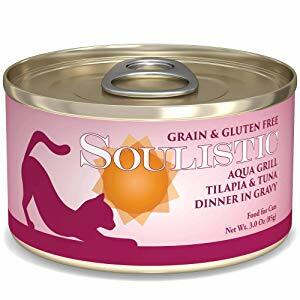 Soulistic is a Petco-exclusive cat food brand made by Weruva, a family-owned pet food company based in the United States. Weruva was founded in 2006 by David and Stacie Forman and is known for meat-based, high-moisture food made with simple recipes and minimal ingredients. Soulistic food is made in a Thai facility that also produces human food and maintains top level certifications from the British Retail Consortium (BRC). The BRC is a global agency that sets an international standard for food safety, packaging, storage, and distribution. While Soulistic products are made in a facility that also processes food for people, they’re not considered human-grade food. The company says they avoid the term because it’s loosely-used and lacks a definition, but it’s also worth noting that a human food facility in Thailand has different standards than a human food facility inspected by the USDA. For example, there’s evidence that Thai human food processing facilities may bring pet food ingredients, including “residues and waste from the food industries”, through their doors. A human food plant in the United States couldn’t legally do that. Has Soulistic cat food been recalled? Soulistic has never been recalled, but B.F.F. (Best Feline Friend), another Weruva brand, has. In 2017, Weruva recalled B.F.F. products sold in Australia due to insufficient levels of thiamine in the canned cat food. The recall was isolated to products made for and sold in the Australian market. What kinds of cat food does Soulistic offer? 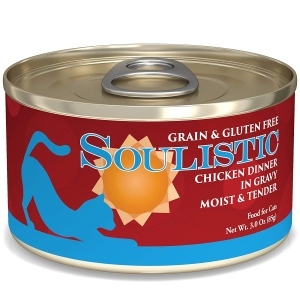 Soulistic offers wet cat food in cans, pouches, and cups. Their foods are broken up into three lines. Original Recipes feature a variety of proteins including chicken breast and whole fish loins. Pâtés are smooth puréed foods available in fish-free or chicken-free flavors, making them appropriate for cats with food sensitivities and allergies. Moist & Tender recipes have a chunky minced texture. All of their recipes use bone-free cuts of meat, reducing the food’s ash content. They’re free of animal or plant by-products, grains, and gluten. None of their foods contain artificial colors, flavors, or preservatives. This canned food is primarily made from chicken breast meat. The meat is shredded and set in gravy. The gravy is thickened with tapioca starch, which contributes significantly to the food’s carbohydrate content. It uses xanthan gum as a binding agent, which is generally considered safe for cats but is neither species-appropriate nor nutritious. Like all Soulistic foods, this recipe has high water content. While plenty of water is great for keeping your cat healthy, it also reduces the food’s caloric density. Compared to more calorie-dense foods, you’ll have to feed your cat more Soulistic food to give them the calories they need. Overall, this canned food is high in animal protein with moderate fat and moderate carbohydrate content. Each 5.5-oz can has 124 calories or 22.5 calories per ounce. This fish-based food contains a blend of tilapia and tuna in gravy. According to Soulistic, their fish ingredients are wild-caught, dolphin and sea turtle-safe, and responsibly sourced. The gravy is thickened with tapioca starch, which increases the carbohydrate content significantly. Although this recipe doesn’t contain grains, fruits, or vegetables, it contains more carbohydrate matter than many other canned foods. Instead of animal-sourced fat, the recipe contains sunflower seed oil as a primary fat source. The food contains xanthan gum as a binding agent. Compared to some other binding gums—think carrageenan—xanthan gum has a good reputation. Nonetheless, it may trigger allergic reactions in some cats and isn’t a species-appropriate or nutritious ingredient. Overall, this fish-based canned food is high in protein from animal sources with moderate fat and high carbohydrate content. Soulistic Aqua Grill has 107 calories in each 5.5-oz can or about 19 calories per ounce. Water Sufficient For Processing, Tilapia, Tuna, Tapioca Starch, Sunflower Seed Oil, Tricalcium Phosphate, Xanthan Gum, Choline Chloride, Taurine, Vitamin E Supplement, Zinc Sulfate, Thiamine Mononitrate (Vitamin B1), Nicotinic Acid (Vitamin B3), Calcium Pantothenate, Vitamin A Supplement, Potassium Iodide, Manganese Sulfate, Ferrous Sulfate, Vitamin D3 Supplement, Riboflavin Supplement (Vitamin B2), Pyridoxine Hydrochloride (Vitamin B6), Copper Sulfate, Folic Acid, Menadione Sodium Bisulfite Complex (Source of Vitamin K), Vitamin B12 Supplement. Chicken and tuna appear to be the primary protein sources in this wet cat food. This recipe contains a combination of chicken and tuna in tuna broth. The meat is minced and set in a tuna gravy thickened with tapioca starch. Instead of animal fat, the food’s primary fat source is sunflower seed oil, which is minimally nutritious for cats. Unlike other Soulistic recipes that contain xanthan gum as a binder, this food is made with guar gum only. Compared to carrageenan and some other binding gums, guar gum has a safe reputation. It’s a non-nutritive ingredient and not a natural part of the feline diet. In addition to synthetic supplements, the food contains celery powder, a natural source of the preservative sodium nitrate. Overall, this minced cat food is rich in animal-sourced protein with high fat and low carbohydrate content. The food contains 83 calories in each 3-oz can or about 28 calories per ounce. What do customers think of Soulistic cat food? Customers appreciate the value of Soulistic cat food as a relatively low-cost alternative to Weruva. Most say their cats enjoy the food. The brand gets a few complaints, but most negative reviews mention Soulistic cat food’s low calorie content and the inclusion of starchy thickeners. Other consumers are frustrated by the brand’s emphasis on fish-based foods. How much does Soulistic cat food cost? Soulistic cat food is a moderately-priced brand, but because it’s so low in calories, you’ll have to feed your cat a lot of it each day. Each time you pop open another can, your daily feeding costs go up. The company recommends that you feed 1 ounce per pound of bodyweight, so it would cost between $3 and $4 per day to feed a 10-lb cat Soulistic food. Overall, is Soulistic a good choice? 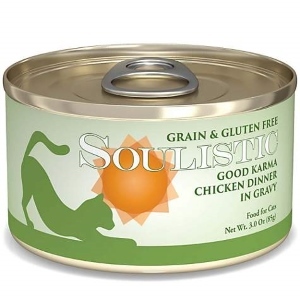 Soulistic cat food can be a great option for those who want to feed their cat meals made primarily from animal protein without fruits or vegetables, artificial additives, and non-nutritive fillers. While Soulistic is doing some things well, it has a few problems. 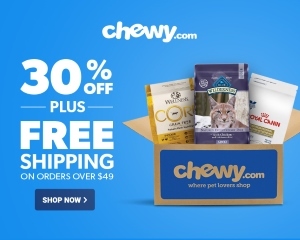 If your cat is allergic to fish or you want to avoid seafood-based cat food, the brand’s emphasis on fish-based meals will whittle down your options to just a few formulas. You’ll also have to shop carefully if you want to limit your cat’s carbohydrate intake. Soulistic recipes vary widely in terms of carbohydrate content. Their recipes range from less than 1% carbohydrates up to over 24% carbohydrates on a dry matter basis. Where is Soulistic cat food sold? Soulistic is a Petco-exclusive brand. You can buy it in your local Petco or Petco Unleashed store and online through Petco.com or Amazon.